Have you ever remembered you need to do something when you get to a specific location later? I have. I’ll remember that I need to buy milk the next time I go to the grocery store. But then later, when I’m at the grocery store, I’m standing there like an idiot thinking “what was it I needed to remember?” Well, I’m happy to report I no longer have that problem thanks to Checkmark 2. 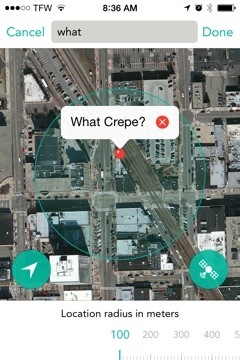 Checkmark 2 will remind you to do things based on your location. Of course the iPhone does this with the built in Reminders app. But the default app simply reminds you to do something when you leave your current location or get to a location in your address book. Checkmark 2, on the other hand, reminds you when you leave any location or arrive at any location, even one you’ve never been to. 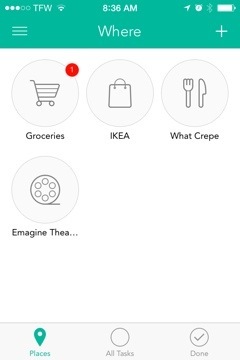 For example when arriving at Costco, the app will tell you what you need. Just set up your locations beforehand and create reminders for those places. It’s really neat! Checkmark 2 sports a well-designed new interface with cute animations. On the left is a slide-away menu that reveals your different task categories. Using the “When” category, Checkmark 2 allows you to set up reminders based on time and date. These are more basic reminders and don’t require a location. But they can be set to reoccur. This is great if you want to be reminded every Monday to do something. You can set ordinary weekly, monthly, etc. re-occurrences, or custom ones like every Tuesday and Sunday at a specific time. The fun really begins in the next category, “Where”. Here you set your location based reminders. Once in this tab, click the plus button in the upper right to set up a location. You’ll name that location and then choose it from your contacts, live map, or current location. 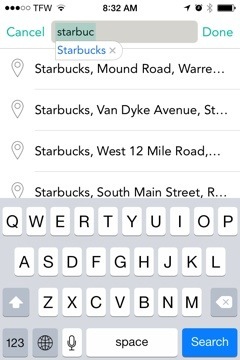 I like the “Add from map” option as it allows you to search and find points of interest without actually being there. So, theoretically, I can set a reminder to go off when I drive by a movie theater to remind me to check showtimes. Once a location is set, you’ll be able to add your new task. Tasks can have notes included too. Additionally, you can set when you want the reminder to fire once at the location. For instance, Checkmark 2 will fire off the reminder immediately, or at increments up to an hour after your arrival or departure. You can also set your task to only fire when you’re at that location on a certain date. If you want the same tasks to alert you at multiple locations, that’s possible too. Just drag two or more locations on top of each other and they’ll merge into a location group. Now the “get milk” reminder will pop-up at all grocery stores I set. Checkmark 2 is also a fully functional un-timed task manager. So if you have tasks that don’t need a reminder of the timed or location sort, they can be created to reside in the “Lists” category. Each list can have multiple items inside. 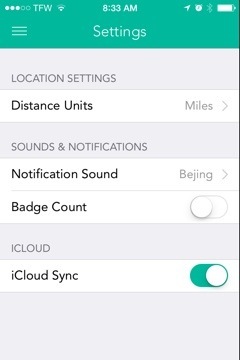 And each of the above categories can be backed up and synced through iCloud. 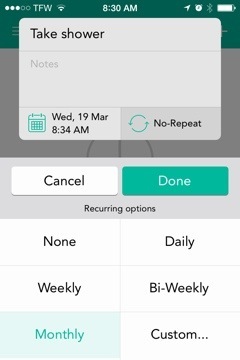 So create once, and your reminders and lists will be on all your devices with Checkmark 2 installed. Checkmark 2 is one of those “look what my iPhone can do” apps. Now, you’ll never need to ask yourself “why did I come to this store?” again. Take a look at Checkmark 2 below and let us know what you use it for in the comments. Checkmark 2 is just one of our favorite shopping apps for iPhone and iPad. We’ve collected all of our favorites here. And if you’d like to see more of our top app selections in different categories, just head on over to our Best Apps Series. RetailMeNot for iPhone – Don’t miss that discount!